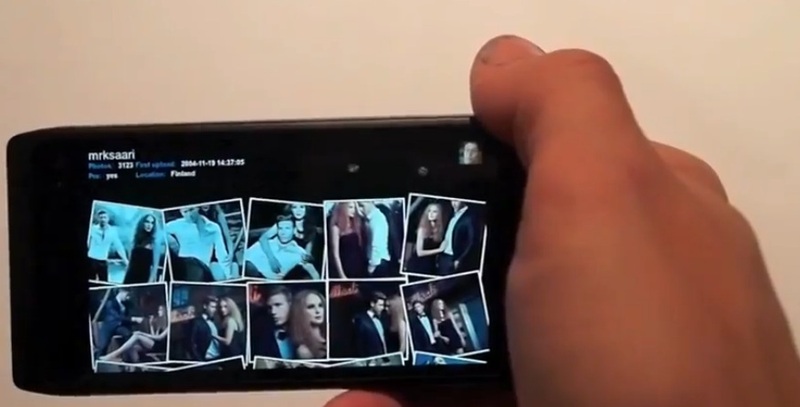 Some of you might remember this QML based Flickr app first being demoed on the Nokia N8. Video tweeted by @camb078 last night, we can see that it’s on the Nokia N950 MeeGo-Harmattan dev phone, so it’ll be on the N9 too. This supports landscape and portrait orientations as well as pinch and zoom. You’ll note that though there’s a lot of swiping gestures within the app, it doesn’t seem to affect the actual main swipe UI much. Perhaps when you get used to it, you’ll know the precise regions where to be swiping (unlike very, very first hands on where there’s some clash between gallery and main swiping). It’s a great looking app, lots of features, good use of animations to play with the eye catching UI.